Ms. Radkey says her research also turned up recent proxy temple ordinances on behalf of Jesus Christ, though he is identified in the records as “Jesus Christian” and “Jesus Cristian.” Ms. Radkey explains the records show that Jesus was baptized by proxy on April 8, 2010, and after initiatory and endowment ordinances, was finally sealed to his “spouse” “Mary Magdelena” on April 9, 2010 – all at the Salt Lake City Temple. The same proxy ordinances were performed for “Mary Magdelena” on the same dates in the same LDS temple. I would be surprised if the LDS Church approved (or would ever approve) proxy temple ordinances for Heavenly Father or Jesus Christ, so please don’t misunderstand me to be suggesting that these records and ordinances had official sanction. However, doesn’t this make you wonder? What led any Mormon to think and act on the notion that Jesus Christ needs proxy temple ordinances like baptism by the “proper authority,” endowments, and temple marriage? According to Mormonism, if Jesus is a god he’s already obtained those essential requirements for exaltation, hasn’t he? Why would Jesus’ mother need proxy ordinances performed on her behalf? If temple ordinances were part of the early Christian church (as the LDS Church claims) wouldn’t Mary have participated in her own ordinances while she was living? What would cause someone to identify Mary’s “husband #1” as God the Father? Is this the logical conclusion to which a Mormon has come based on the teachings of Brigham Young and other early LDS leaders? As Ms. Radkey asks, “Why was ‘Heavenly Father’ listed in New FamilySearch—not only as the spouse of Mary—but as a living being who could possibly need LDS ordinances? Does LDS doctrine naturally lead to this kind of thinking about God? This entry was posted in Baptism for the Dead, Mormon Temple. Bookmark the permalink. One thought is if these were found online, then maybe someone had hacked into the server and added these. They remain on there because they have not been found by the administrators of the site or they have been found and put on a list of things to fix when they get up to that point. Thus no temple ordinances have been performed. 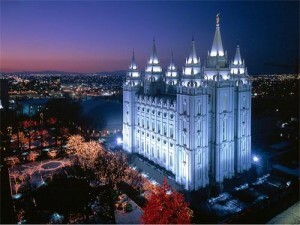 Its just a ‘practical joke’ by either a disgruntled member or someone who wants to denegrate the LDS church. As far as I know no one here where I live believe that any of this work needs to be done for Jesus or Heavenly Father. And no I don’t think that LDS doctrine leads to this kind of thinking. mainly because Heavenly Father is God and does not need temple work performed for Him; and official doctrine does not state one way or another that Jesus was married or who to if He was. Many members believe that He was, but if official doctrine is left empty, then the work of sealing cannot be performed. As for the initiatories and endowments, from my understanding either He does not need them, or they were given to Him on the Mount of Transfiguration when He spoke with Moses and Elijah, so either way, they do not need to be performed for Him in these days. I for one am breathing a sigh of relief knowing that the Mormon god(s) don’t need proxy work in the Mormon temples preformed for them. Actually it wouldn’t make any sense since, to my understanding, the temple ordinances are part of the sequence of ritual events on the way to becoming a god. So if someone is already a god, he wouldn’t need temple work done for him. Since we are celebrating the Fourth of July and the Declaration of Independence in the United States this extended weekend, I would like to point out again that Wilford Woodruff claimed that the signers of the Declaration of Independence appeared to him requesting that the pregod rituals be completed for them. There’s more to the account but I think the reader gets the drift here. Modern day Mormons aren’t half as creative at Wilford Woodruff when it comes to stories of the appearance of spirits. BTW, if a Mormon wants to really get into these occult experiences it really isn’t all that difficult. They just have to embrace the practices of the founders of their religion and get themselves a magic rock and cultivate the technique of second sight vision. As a former Mormon, I think that these are Mormon pranking the system, for whatever reason. It’s not hard to submit names and do the work yourself. What gets me is these things aren’t caught (“Jesus Christ” must get flagged by the computer system, but the others obviously don’t yet). I seem to recall a bible story where a couple withheld part of there offering, and Peter knew instantly that they where cheating the Church. Where is the inspired Mormon temple worker who missed “God the Father” as a name? I hate to sound cruel, but the whole thing is a scam anyway. It’s a Mormon thing, unique to their religion and is one more feature that can be pointed to as Mormonism not being Christian. The ceremonial buy-in gives Mormons the false impression that they are into something really spiritually deep and significant. The rituals are a good way to solidify a person’s commitment to the group and close the trap. Joseph Smith borrowed heavily from his membership in Free Masonry in developing the rituals. Seriously, I can’t believe that the rank and file can’t see through this hoax but that’s why they’re the rank and file. Ralph, do you believe that Heavenly Father needed to go through temple ordinances in his first incarnation before becoming our God? If so, what evidence can you give? Blessed is the God and Father of our Lord Jesus Christ, who has blessed us with every spiritual blessing in the heavenly realms in Christ. For he chose us in Christ before the foundation of the world that we may be holy and unblemished in his sight in love. I believe that every spiritual blessing includes complete salvation. What you might call fullness of salvation. If I was predestined for that fullness before the foundation of the world how can anything I do or not do affect my salvation? The rest of the verses through 14 tell us that this was done to the praise of his glorious grace that was freely bestowed upon us in his dearly loved Son. This buys us redemption through Christ’s blood, forgiveness of sin according to His grace. This is all according to His will and His good pleasure. Salvation is an accomplishment of God for His purposes alone and is accomplished according to His will to the praise of His glorious grace (vs. 5, 6, 11). No man centered law keeping or pagan ordinance can add to God’s will, and neither will the failure to adhere to said pagan ordinance or law destroy God’s will since it is done for His purposes alone. Put plainly: Those who are predestined will be saved apart from any work that they do and produce good works in accordance with that God-given salvation (Ephesians 2:8-10). The LDS church’s doctrine runs contrary to true scripture and is plain to see if you take off your eisegetical goggles. I must admit that my heart jumped-which is at least as good as a burning in the bosom-when I read your last paragraph. I am, of course, a big fan of Paul’s letter to the Ephesians especially chapter one. If you want a good Bible study exercise, take a red and a blue marker and highlight the pronoun referring to the Father and the pronoun which refers to the Son. For example Ephesians 1:4 says “just as He chose us in Him before the foundation of the world that we should be holy and blameless before Him.” Who did the choosing? And in whom were we chosen? And in whom will we be blameless before? Ephesians 1:5 says, “He predestined us to adoption as sons through Jesus Christ to Himself according to the kind intention of His will.” Who is “He”, and who is “His”. Ephesians 1:6, Him, His, His. Ephesians 1:7, Him, His, His. Ephesians 1:9, He, His, His, He, Him. Ephesians 1:10-11, Him, His, His. Ephesians 1:20, He, He, Him, Him His. Ephesians 1:22, He His, Him. OK, I got a little carried away here but this is a perfect working together of the Godhead. One God, three persons. Ephesians 1:13-14 shows the relationship of the Father, the Son, and the Holy Spirit. I get really pumped up when I see not only what the Father did for us through the Son but how the very essence of God, His Spirit indwells all of us who have come to Him in faith and have been born again. These foolish Mormons. They could have it all but instead they exchange the truth for a lie. I’m using the New American Standard Bible so the rendering is different than the version of the Bible used on this blog. What’s really fun is to take a Living Bible, which is more of a paraphrase than a translation, and see how the verses read. I like the NASB because of it’s accuracy as a translation. None-the-less I think we can see what Paul was getting at here in the first chapter of Ephesians. Peter, an apostle of Jesus Christ, to those who reside as aliens, scattered throughout Pontus, Galatia, Cappadocia, Asia, and Bithynia, who are chosen according to the foreknowledge of God the Father, by the sanctifying work of the Spirit, to obey Jesus Christ and be sprinkled with His blood: May grace and peace be yours in the <fullest measure. Blessed be the God and Father of our Lord Jesus Christ, who according to His great mercy has caused us to be born again to a living hope through the resurrection of Jesus Christ from the dead, to obtain an inheritance which is imperishable and undefiled and will not fade away, reserved in heaven for you, who are protected by the power of God through faith for a salvation ready to be revealed in the last time. God the Father chose us, God the Holy Spirit sanctified us (set us apart as holy) to be obedient to God the Son Jesus Christ. God’s great mercy has caused us to be born again to a living hope through Christ’s resurrection (another proof that Jesus is God and has defeated sin and death) to an inheritance (eternal life) that is imperishable, will not fade away, and reserved in heaven for us because it is being protected by the power of God who sustains our faith (because it is from Him in the first place) for a salvation ready to be revealed in the last time (because although we already possess salvation it is not yet realized until the Day of Judgment). Again, why would anyone trample on the blood of Christ and submit themselves to an unbiblical set of rules and pagan ordinances when God will accomplish their salvation fully if they only confess, repent, and believe in the true Jesus Christ (not the spirit child of a spirit child of a spirit child ad infinitum) and his perfect atoning work on the cross? I would say that the Christian posters here do a good job of “contrasting and comparing” the doctrines of Biblical Christianity and the aberrant cult of Mormonism. The problem that Mormons have is that they are left to defend the odd, peculiar and really off-the-wall statements and teachings of their “prophets” and leaders, especially those of the 19th century. If something is just too weird, even for Mormons, they declare the teachings and proclamations of these prophet/leaders as either just their opinions or null and void in light of new, continuous revelation. We know that at least one of the sacred, ancient Mormon rituals has been changed because it was just way too far off the bubble for the sensibilities of modern folks. So much for ancient wisdom and sacred rituals that have (ahem) stood the test of time. If a person has an interest, their are video demonstrations of these rituals available on the internet along with still pictures and the text that goes along with them. It is truly creepy stuff. Of course Mormons will claim that those of us who see these rituals for what they are, are just not spiritually gifted enough to be able to receive all of this truth and wisdom. I’ve read accounts where people go through these Temple rituals and have a less than positive experience and impression. Like all things Mormon (keep reading the BoM until you get a testimony) the person is told to just keep going through the rituals. The point is that eventually you’ll become desensitized to the strangeness and occult nature of the experience. The fact of the matter is that Joseph Smith made his religion up as he went along. Creative fellow that he was he borrowed heavily from Free Masonry of which he was a member. Of course this is all explained away by Mormons as ancient wisdom, regardless where it came from. Bottom line, these rituals are not only unnecessary but they have their foundation in the dark side of the spirit world. Spiritual blindness on the part of Mormons does not lend itself to someone being able to see these rituals for what they are. Their thinking is totally flipped upside down. Sounds like someone making a joke about Mormon theology. I can imagine a Mormon reading about the church’s history, getting upset (as they really do a lot more than most Christians who lose faith, I’m sure it’s an investment thing), and following up with a vengeful prank while their recommends were still usable. I mean sheesh, give those exMo’s a punching bag! I can feel the devastation firehosing in droves off their exit stories, it’s like someone died. On an emotional level, I can understand why someone would rather find live with some off-beat, desperate solution to a faith question than lose their faith. That’s no excuse for the truckloads of confirmation bias over, say, Mesoamerica and the limited-geography theory, but it helps me become more understanding and caring when someone mentions one of the many, entirely ridiculous claims that come along with that idea. The fact of the matter is that these rituals, that the pranksters are spoofing are worthless whether someone believes in them or not. The rituals have no power to save anyone or provide them with a pathway to becoming a god as Mormonism teaches. Joseph Smith turned away from the gospel of Jesus Christ and created another gospel and infused it with phony rituals that are about as effective as his magic rock treasure hunts from his early days. So Mormons turn away from God to chase after pagan gods and mindlessly repeat rituals that they hope will provide them with the fullfillment of what is a false hope and promise. The shed blood of the cross of Jesus Christ was the fullfillment of God’s requirement that we be holy and righteous before Him. We can’t add anything to Jesus’ perfect sacrifice. Thanks for sharing the passage from the first chapter of Ephesians. I have read this chapter many times. It just leaves me in awe. As Christians, we have every spiritual blessing. As you said, rituals cannot give us a right standing with God. Making solemn promises to keep the law, promises guaranteed to be broken as many times as made, just reveal our hopeless position of guilt. Only the perfect obedience of Jesus Christ, freely credited to every believer, can make us righteous in God’s sight. In the sixth chapter of John, after crossing the Sea of Galilee, Jesus spoke of how “all that the Father giveth me shall come to me” (v. 37). And what of those who do? “He that believeth on me hath everlasting life” (v. 47). It doesn’t take too long for the Mormon house of cards to fall a part. Pull out any one of several cards and the cascade will commence. Such is the case with the Mormon Temple rituals. Where did these rituals come from any way? Are they presented and explained in the Bible? Do we read in the Book of Acts or any of the Epistles about these rituals and how, where and why they are to be conducted? No we don’t. The fact of the matter is that Joseph Smith lifted them from Free Masonry and what he didn’t steal he invented. The ancient Temples of the Jews had a specific purpose and what that purpose was, is well documented in the Bible. Jesus was the Lamb of God sacrificed for our sins. He fullfilled the promise of the Father. Christians don’t have Temples because as born again believers, we are the Temple of the Holy Spirit who indwells us. There are no more sacrifices except that our lives are to be living sacrifices. Our works in love and mercy, the expression of our faith, are to be a fragrant offering to the Lord. So Smith’s Temples and all his doda rituals are enough to fool some people, but the whole sale rejection of God by Mormonism will result in spiritual death. Brian, thanks for the nod. My point was two-fold, however. Every spiritual blessing was given to us by God alone as the result of His choosing and His will, not by any decision of our own, and therefore it is secured by his power as Peter stated. If you read John 6:44 it will also confirm that nobody can come to Christ unless the Father draws them. The argument between God’s sovereign choice in salvation (monergism), verses God making salvation available to everyone, and bestowing it upon all who exercise their free will to take it (synergism), is a sticky issue amongst Christians. A lot of mud is thrown over it. Synergistic Christians must necessarily align themselves with Mormons on this issue because their soteriology is from the same roots: Pelagius and Arminius. Mormons are true Pelagians believing that each person is as free from sin nature as Adam was, and true Arminians in that they believe that a person can also choose to reject Christ and lose salvation. Many Christians are semi-Pelagian and semi-Arminian believing that man is not totally depraved and dead in sin without any ability to decide on their own whether or not to choose or reject salvation. Mormons believe that they must continually maintain their salvation by constantly doing good works of the law, etc., and merit extra salvation above the universal atonement of Christ by partaking in rituals commanded by their god. Most synergistic Christians believe that once they accept God’s gift he cannot take it back. Some of this theology flows from the idea that God created man so that He could love them, but due to sin in their lives he cannot have them in heaven with Him, which is all He truly desires. By accepting his gift of salvation they are sinless in His sight and He can at last overlook the rules of Holiness that He imposed and have them in heaven with Him some day. Sadly, this God is unable to realize his true desire to save all, but is subject to man’s free-will choice to save himself. Before any Mormon jumps in on your post I think I must remind them that anything they might propose is Mormonism not Christianity. There are some differences of opinion regarding election among Christian sects but what someone believes about the things you discussed above has little or no bearing on their salvation. The primary thing is that folks recognized who God is and understand that only a qualified Savior can save. Mormonism has a different god and a savior that is not qualified to provide the gift of eternal life. In fact the Mormon god and the Mormon Jesus don’t exist therefore they can’t offer anything but disappointment. The Bible says the following about election. 2. Sinful man is the object of God’s judgment. Judgment is directed towards sin. 3. From the mass of sinful humanity, some are elected to eternal life. Ephesians 1:4-5, 9, 11; II Thessalonians 2:13. 5. Foreknowledge and election are not based on any foreseen merit or faith in the individual. Election is unconditional. There are five views on how election relates to the free will of man. 3. In some unknown way, election secures the salvation of some in such a way that their wills are not forced. Election is a mystery-Not everyone has the ability to come. 5. God did not elect individuals at all. He chose Christ only, and everyone in Christ is elect. Again, the bottom line is, recognize that there is but One God in the universe. There is only one pathway to salvation and that is through the qualified Savior Jesus Christ. Jesus is the physical manifestation of the invisible God. Only faith in Him will bring someone eternal life. So regardless is someone is a Calvinist or an Arminian, it really doesn’t matter because belief in either theological perspective won’t insure anyone eternal life. It’s faith in Christ that provides the solution to man’s problem with sin. I think you are precisely right. Election is a mystery – God chooses people, this is apparent from Scripture – think Moses, Abraham, Paul. We are called God’s Chosen people. However, election is in Christ. There is no other election – in the end, if you are not in Christ, you are not elect and will not be with the Heavenly Father in eternity. Thanks for the additional comments Falcon and mobaby. If a person is truly saved by Christ their position on soteriology will not matter in the end because it is Jesus Christ who saves. Most Christians will never swim in the deep end of the theological pool and their position on the manner of salvation makes no difference because the fruit that they bear is evidence of their salvation, not the way they express the manner of their salvation. Calvinists and Arminians both make the same confession of faith in the LORD Jesus Christ for the forgiveness of their sins. Falcon is dead on when he says that it has to be the correct Jesus Christ that one confesses, but it is also true that it is the Spirit of Christ that regenerates us to make that confession, whether we are willing to confess that or not. We were all saved as Arminians, but it doesn’t take long to realize that you can’t rationalize or convince a person into the Kingdom of God. Jesus Himself told the Pharisees that they could not believe because they were not His sheep. Is anyone here bold enough to say that they could work a greater miracle or give a truer sermon than God the Son that would convince someone of the truth of the gospel? This is why we can present all the facts in the world to the TBM’s and their hearts grow harder and harder. Of course they will make the same claims about us, which is fine. The Jews crucified Jesus despite clear proof that he is the Son of God and the Messiah (Christ). The Mormons believe that JS was a prophet of God despite clear evidence that the BoM is a 19th century production, his failed prophecies, and gross immoral behaviors that they make excuses for. Blindness is blindness. Only the Holy Spirit can open their eyes. The Mormon Temple rituals, in my opinion, have the effect of leading people away from Jesus Christ and God’s offer of salvation through Him. When Mormons participate in these rituals, they give themselves over to a false spirit that has, as it’s goal, the rejection of God. Mormons are basically trading faith in Christ and His finished work on the cross for a system of works. These rituals are devoid of the Spirit of God but do provide a sense of “spirituality” for a Mormon. About a year ago, I was talking to a guy who had left the Mormon church (he was a convert and his wife had grown up in Mormonism). They had gone through their first dead dunking ritual. They were driving home in silence when all of a sudden in unison, they looked at each other and said, “Wasn’t that weird? !” They started making excuses for not serving their rotation. They eventually left Mormonism. Mormons have all sorts of excuses for this type of reaction to the occult Temple rituals. The person needs to keep going through the Temple they say and eventually they become so desensitized, numb and indoctrinated that they lose all sense of spiritual discernment regarding these occult practices. For others, the revulsion they feel serves as a catalyst to move them out of the cult and into a saving relationship with God through Jesus Christ. I think liv4jc, falcon, and mobaby are engaging in an interesting discussion. As a Mormon, I believed that everyone would be afforded the opportunity to hear the Gospel and either accept or reject it. This meant that I believed in preaching to the spirits in prison, which is the Mormon version of purgatory. The time between death and judgment was divided into two places, paradise or prison. Naturally, Mormons who had proven themselves to be worthy went to paradise while nonvaliant-to-the-end Mormons went to prison along with nonbelievers. As a Mormon, I viewed election in the terms of being a Mormon. If one was a Mormon, then one was elected. This didn’t mean others could not be elected. I once had a discussion with a group of Calvinists, and they seemed to intimate this same thought. Personally, I am neither a good Calvinist nor a good Arminian, and that’s by choice. I don’t want to be polarized. I can see the merits of teaching eternal security, because it just seems that God does everything in His power to keep us in His care that it almost seems as though we no longer have free will. He won’t let anything or anyone grasp us from His hand. Can we jump out of His hand? There are those who say we can. I’m not so certain. And yet, I see the argument for our ability to choose to turn away from God. We do have free will. It’s a matter of emphasis. This is why it’s important to understand that theology is broken up into three categories: dogma, doctrine, and opinion. What we are discussing is not a salvation issue. I think Mormons tend to make everything a salvation issue. Maybe OJ would like to respond to that. our heavenly father sent his son jesus christ to come down to earth and atone for the sins of all man kind,and his mission was accomplished but we need to do something so that this can be completed which is the ordinances and the principles of the gospel.am not a mormmon but i believe that temple ordinances are important especially baptism for the dead,because i came across it in the scripture.this is all i can say and i will be happy to one day become a mormon if am opportune because joseph smith was reveal to me in my dream.